The Americans have an uncanny knack to do big, giant or mammoth things well. Be it food, buildings, roads or their monuments, if it is on a gigantic scale, they can probably pull it off better than anyone else. And the same goes with their cars too. Back in the 30s, the American made massive luxury cars like the Duisenberg, in the 50s Cadillac was king of the hill with its huge tail fins and then of course, everyone remembers the 60s and 70s where horsepower was everything and American cars had close to 400PS for next to no money at all and enough testosterone to last a lifetime. Fast forward to the 90s when the SUV bug really started to catch on and the likes of the Hummer H1 and the Cadillac Escalade were more desirable than the run of the mill sportscar. And in India too, Ford brought us the Endeavour; a large bulky and if I dare say, manly SUV that quickly became the favourite with those looking for a large, muscular SUV that gets them the attention on the road. Sadly though, the Endeavour did not evolve with the times as well as it should have and it soon became a footnote in the history of the SUV in India with sales at an all time low and appeal to match. Now though, the Endeavour is back. And it brings back everything great about the American SUV in one word: SIZE! Let’s get one thing straight out of the way. The new 2016 Ford Endeavour is massive! It is Huge! In fact, the Endeavour parked next to the likes of the Hyundai Creta, it makes the latter look like a hatchback. And it isn’t all boxy and square like it used to be earlier either. We particularly like that large and imposing front grille that is true to Ford’s design language but still looks apt for this massive car. The headlights too get a very detailed daytime running light and projector package and even on the whole the design looks very aggressive which bodes well for the car. The side profile has a few well placed design cues like the engine badge on the front fender and the large chunky door handles. The 18-inch wheels, finished in a grey and polished finish combination tie up the design well. At the rear, the first big difference in the new Endeavour as compared to all the old ones is the fact that there is no spare wheel mounted on the tail gate which instantly makes the car a lot more current looking. The new Endeavour also gets a set of LED tail lamps that look really smart in general as well as when they are lit up. Of course, if you do want to remind everyone what your shiny new SUV is called, there is always that big large stamped chrome accent piece on the tailgate which displays the Endeavour name proudly. The front and rear bumper also get a very useful and well styled set of scuff plates which have been finished in a shade of matte silver. On the whole then, the Endeavour not only looks much better than what it used to but also much better than anything else in its category. The new Ford Endeavour gets a brand new interior that includes a new dashboard, new seats and pretty much everything else in between. The dashboard is typically American with a large horizontal slab like design with a gloss grey finish that offsets well with the beige lower half and the dark brown leather wrapped upper half. The Endeavour also gets a large touchscreen infotainment display that has been set within a similar gloss grey surround and flanked with two large chrome AC vents. The lower part of the dashboard gets basic controls for the audio and the climate control system. You also get two 12-volt adapters and two USB slots that can be used to charge your phone, iPad, etc. Coming to the seats, the Endeavour comes with beige interiors on all variants and comes as a seven seater as standard. The front seats are large and comfortable and come with ample support. When it comes to space, there is no surprise that the Endeavour offers more than enough of it in the front and mid rows. The middle row seats are also quite supple with soft leather and recline to add to the comfort levels. The last row of seats is a little cramped but one could adjust the centre row to get a lot more space. The third row also has enough headroom due to scooped out spaces in the headliner which makes sitting at the rear a better proposition that usually applicable. The driver’s seat is controlled electronically while the passenger seat in the front and all other seats are controlled mechanically with the exception of the last row. On the larger 3.2-litre engine versions of the last row of seats come up and down at the touch of a button which makes storing things really easy. The larger engine versions also get an electronic tailgate-shutting feature. The top of the line version also gets a large panoramic roof and sunroof. The new Endeavour also comes with noise cancelling technology, which cuts out major chunks of ambient noise and is a segment first. What is missing though are features like a Start-Stop button which in a car of this segment should definitely be a standard feature. The Ford Endeavour we drove here is the top of the line version with the 3.2-litre, 5-cylinder, turbocharged diesel engine that makes 200PS of peak power and 470Nm of peak torque. The engine is mated to a 6-speed automatic gearbox and comes exclusively with an all-wheel-drive package. The 3.2-litre engine is great to drive and putting your foot hard down on the throttle makes the Endeavour accelerate like a train! The 6-speed gearbox isn’t slow and shifts well going through the gears without much lag or loss in revs. The engine does seem a tad bit loud when revved hard but in the city at normal speeds, it does feel rather well sorted for overall NVH levels which was one of the biggest issues of earlier Endeavours. Although most people who buy the Ford Endeavour will never really take it off road, the Endeavour does come with a whole bunch of gadgets and gizmos that let you tackle almost any terrain. Adapted from the Land Rover terrain response, the Endeavour offers modes like gravel, sand and snow apart from hill descent control. You also get a conventional low range option along with a locking differential option that help you tackle slightly more hair raising terrains. All in all, the Endeavour does still stay true to its off-road capabilities. Ford learnt a lot of things from its ownership of Jaguar and Land Rover and ride and handling was definitely on top of that list. Where the old Endeavour was more like a boat with wheels, the new one is a huge step up both in terms of ride quality and handling. Let us start with ride first. The Endeavour is a high riding SUV and with most modern SUVs is quite comfortable. It does gobble up potholes and other undulations in the road with its massive 265/60 R18 tyres and well set up damping but we think on the whole, Ford has done a mighty good job with setting up the new Endeavour for the Indian audience. At the same time, the handling has not been compromised to make it floaty and ungainly around bends. Yes, being a high riding SUV there is a fair bit of body roll, especially considering its sheer bulk, but the Endeavour does behave well when asked to corner at moderate or high speeds. We also think the all-wheel-drive system has become far more intelligent that anything else in the segment (barring the likes of the Audi Q3) and does keep the mass of the vehicle in check. The Endeavour gets disc brakes all around and although we would have liked to brakes to have been a little more responsive and more powerful, the ones on the car are not disappointing. With two engines on offer, a 2.2-litre making 160PS and a 3.2-litre making 200PS of power, the Ford Endeavour will certainly not return magical fuel economy figures. Although we think manufacturers should be claiming figures in the early teens, realistically, the Endeavour will return single digit figures when used in start-stop city traffic. With prices ranging from Rs 24.75-26.68 lakh for the 2.2-litre engine and from Rs 27.78-29.46 lakh for the larger 3.2-litre engine option, the Ford Endeavour is well priced against its biggest rival, the Toyota Fortuner too. All in all, with all the gadgetry and gizmos thrown in, the Endeavour is certainly a more value for money option too. The Ford Endeavour is one of those rare cars that everyone in the ZigWheels team unanimously likes and finds hard to fault. We do not know if the new styling and aggressive current looks strike a cord or whether it is a good performance, there is certainly something about the new Endeavour that makes us sit up and notice. So does that mean that the Toyota Fortuner finally has something to worry about? 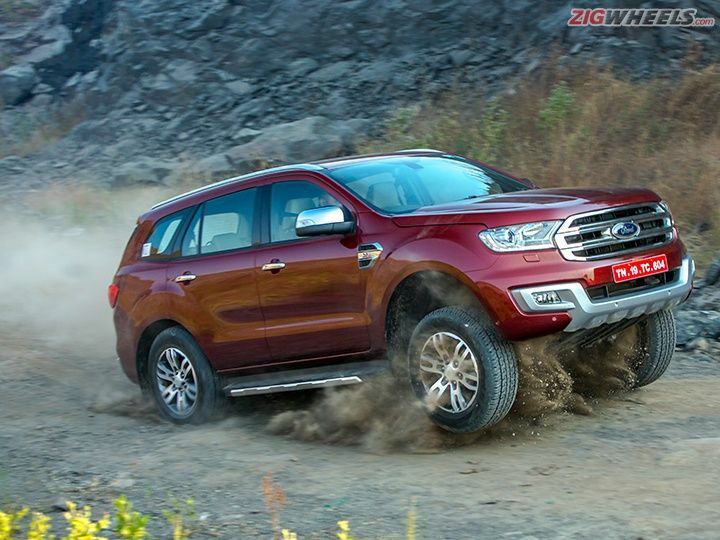 Well, with the kind of package Ford is putting up on the table and with the Endeavour brand to fall back upon, we think this is the first real threat to the Fortuner’s outright superiority in this segment. Would we recommend you go out and buy one? Well, if you were in the segment for a big large SUV that is well equipped, drives well and looks great, the Ford Endeavour might just be the new king of the segment. But for that, tune in to ZigWheels.com soon for an indepth comparison review. Share your experiences with Endeavour [2015-2019]?